Two of Western Ferries' fleet, the Dutch-built sisters SOUND OF SCALPAY (right) and SOUND OF SANDA, seen at Hunter's Quay this evening. 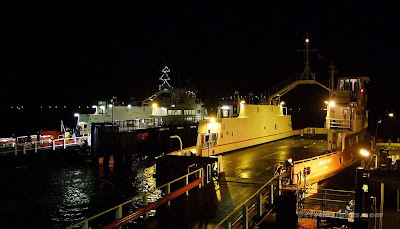 As usual, SOUND OF SANDA has had her mast festooned with coloured lights for the Festive Season. SOUND OF SCALPAY was lying off service due to the weather, which today saw many west coast ferry services disrupted to varying degrees. Another night shot cracker ! !